If you’ve ever seen AMC’s The Walking Dead, you’ll have noticed that episodes of the show tend to follow a very predictable pattern. Something really interesting and surprising happens in the first ten minutes, which grabs your interest and makes you excited to keep watching. This is followed by roughly thirty minutes of aimless wandering, idle chatter, and speeches about the unfairness of life, during which time you zone out and mostly stare at your phone. Then, in the last three minutes there is another interesting and surprising event which leaves you hungrily awaiting the next episode. The Fifth Season is the high fantasy novel equivalent of an episode of The Walking Dead. The set-up is narrated in the second-person and introduces you to the main cast of characters. A woman is mourning the death of her son at the hands of her husband. A mysterious figure in a shining city causes untold destruction. An ambitious acolyte takes on an undesired task. It is written in a way that reminded me of death’s narration in The Book Thief, distant but personal at the same time. Things were off to a good start. 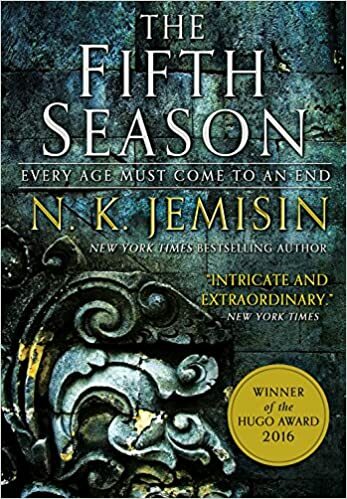 The problem comes when Author N. K. Jemisin continues to employ that second-person narrative style in every chapter focused on Essun, the main female protagonist. Rather than adding an extra layer to the story, switching back and forth from the second to the third voice was incredibly jarring. It pulled me out of the story time and time again. After its promising beginning, The Fifth Season spends the bulk of it’s 350+ pages moving various characters from one place to another. This offers multiple opportunities to explore the land and peoples inhabited in this world, but also becomes increasingly tedious as time goes on. At some point my curiosity dwindled, and I no longer cared very much about the fate of the broken Earth or its residents. You can find The Fifth Season here on Amazon or here on Book Depository. Next Article Thrift Store Finds!